Price: £1.39 (incl VAT) Sorry, this item is currently unavailable. Click here to receive notification when this product comes back into stock. For the relief of coughs in children and babies over 1 month. 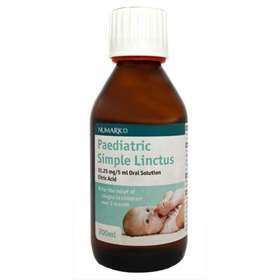 Numark paediatric simple linctus is a demulcent. (a substance that relieves irritation of the mucous membranes in the mouth by forming a protective film) which coats the throat relieving the symptoms of a cough. Children from 1 month to 5 years: One to two 5ml spoonfuls (5ml-10ml) can be taken up to 4 times daily. May upset the stomach or cause dental decay if taken in large doses. Your child is allergic to any of the ingredients. Your child is taking any products containing Potassium Tartrate, Carbonates or bicarbonates. If you have been told by your doctor that your child has an intolerance to some sugars, contact your doctor before using this medicinal product. Active ingredients: Citric Acid Monohydrate 31.25mg per 5ml. Other ingredients: Star Anise Oil, Sucrose, Polysorbate 20, Water. Product code: 3737442 Price: £1.39 (incl VAT) Sorry, this item is currently unavailable. Click here to receive notification when this product comes back into stock.